The Octane ZR8 is one of four Zero Runners offered by the company, an advanced elliptical trainer giving you more freedom of movement than the typical machine. With an unmatched 58" stride, plenty of workouts, Bluetooth tracking and almost zero impact on the knees and joints, this one is a real winner. The ZR8 is commercial-grade with premium components. It's very sturdy and provides one of the most natural movements you'll find on an elliptical. It has an LCD display that shows you all of the important workout information, including distance, time, program, calorie, resistance and more. The Zero Runners have become quiet popular over the last few years, as they give users the ability to completely stretch out like they are running on a treadmill, except without all of the impact on their joints. So it's really the best of both worlds, a treadmill/elliptical hybrid that can accommodate walkers, joggers and runners alike. The ZR8 is very similar to its little brother, the Octane Zero Runner ZR7, except with a few upgrades. Both models have a dynamic 58" stride, quiet operation, solid build, Bluetooth compatibility, tons of workouts and cross circuit training capability. The Zero Runner ZR8 adds some finishing touches, like aluminum legs. lightweight rubber non-slip pedals and performance grips. It also has resistance setting capability that the ZR7 does not have. It also has more advanced wireless heart rate monitoring capability: Bluetooth 4.0 /ANT+ strap rather than the Polar one on the ZR7. As we mentioned above, you get a ton of built in workouts to choose from. There are 4 built right into the machine, but you get a boatload of additional ones through the Octane Fitness app. You have 14 endurance programs, 12 tone up programs and 10 active recovery programs, so you can really change things up from one workout to the next. Both Zero Runners come with cross circuit attachment bands with 7 different places to attach them to for a stimulating off machine workout. So you can mix up some on and off machine movements for a more complete routine, targeting more muscle groups. Overall, the motion of the ZR8 is incredibly smooth and natural, like most of the Octane ellipticals, and the workout variety is quite challenging. You feel almost no impact whether you choose shorter strides or an all out sprint, and your body will thank you for it later. The elliptical can accommodate up to 300 lbs., and it comes with a generous warranty: Lifetime on the frame, 5 years on the parts and 1 year on labor. How Does the ZR8 Compare to the Other Octane Ellipticals? One of the interest things about Octane ellipticals is that all of their machines are different, so it's hard to compare one to the other. That's because all they make is ellipticals, so they have a laser like focus on all things elliptical. There are several different categories: Standing, Recumbent, LateralX and the new Max Trainer and of course the Zero Runners. The standing ellipticals are the flagship models of the company, consisting of the Octane Q35, Q37 and Q47 machines, as well as some commercial grade versions of these machines. These traditional ellipticals have either fixed 20.5" strides or adjustable 18-26" strides...so not even half as much stride length as the 58" you get on the Zero Runners. The also don't have the Cross Circuit training capability and are much bulkier and larger than the ZR7 and ZR8, so they take up much more room in your home gym and are harder to transport. The recumbent Octane ellipticals consist of the XR4, XR6, XR650 and XR6000. These are very much like the standing ellipticals as far as footprint is concerned, except you're seated while you work out. They have fixed stride lengths, and offer all of the advantages and disadvantages of the standing ellipticals. The LateralX is very much like the traditional ellipticals as well, except as you might have guessed by the name, there is a side to side component to the motion. This allows you to target muscles that you can't hit on traditional elliptical trainers. So here you are moving forward/back, up/down and side to side. These Octane ellipticals are relatively new, and they have become quite popular at health clubs. 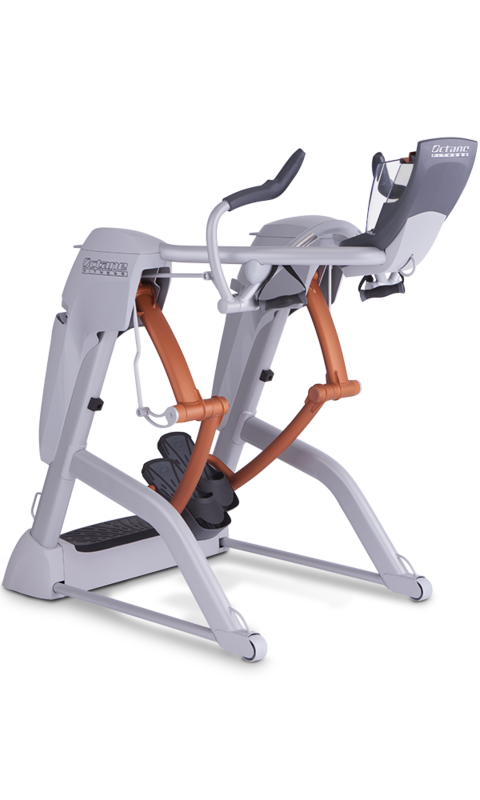 The newest addition to the lineup, the Octane Max Trainer MTX is a commercial-grade version of Bowflex's popular Max Trainers (M3, M5, M7) as the parent company Nautilus recently bought Octane. So this is a club quality hybrid machine...an elliptical trainer and a stepper all in one, for a unique kind of workout. How Does the ZR8 compare to the ZR7? If you look at the ZR8 vs the ZR7, the two Zero Runners are very similar in many ways as we discussed above. When looking at the ZR7 vs the ZR8, the two machines are very similar with a few differences worth noting. If you look at the two machines side by side, it's obvious which one of the two is a more advanced machine. The ZR8 is built stronger with aircraft-quality aluminum legs, lighter pedals, more resistance variation, contoured handles and performance grips. So although both Zero Runners are awesome, the ZR8 is more of a next level elliptical trainer. It's also about $1000 more expensive, so you have to decide if the enhancements are worth it. The ZR7 should be perfectly fine for most home users. The Octane Zero Runner ZR8 is an incredible machine, with one of the largest stride lengths on the market today. You have total freedom of movement up to 58", so you can choose anything from short stepper-like motions all the way up to a full out sprint. All without almost zero impact on your knees and joints. At over $4,000 it's definitely on the pricey side, but it is a top quality machine with capabilities that you simply don't find anywhere else. If you want to save a little money, take a look at the Zero Runner ZR7 model as well. It's not as high grade, but it has everything you need for a great workout in your home.